Thirteen stalwart (and well wrapped up) members of the Group met at Leysdown on Saturday morning for our first group outing of 2018. With a biting north wind, we needed those layers. The tide was out when we arrived. We were greeted by a pied wagtail on the seawall, and several black-headed gulls checking whether Malcolm had any bread for them. Once they realised that nothing was forthcoming, they moved off to join the rest of the gulls on either the beach or the playing fields opposite. In the trees beyond were a group of rooks (some of them on guard duty by nests, which seemed amazingly early), along with wood pigeon, collard dove and crow. 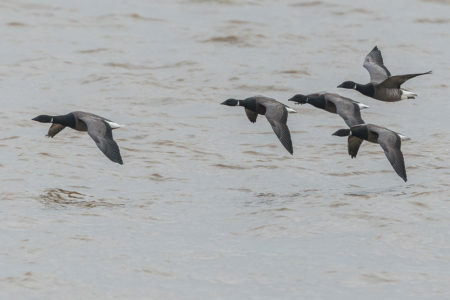 A group of brent geese were pecking about on the wet sand. Also feeding on the recently uncovered beach were curlew, oystercatchers, sanderling, dunlin and a great black-backed gull. As we walked along the sea wall we noticed some raptors flying over the fields behind the football pitch, and decided to move inland to get respite from the strong wind. A song thrush flew past as we neared the fields which held more black-headed gulls, common gull and a couple of grey heron. There were at least 19 red-legged partridge, mute swan and several marsh harrier in this area. We moved towards Muswell Manor, where some of the group found several reed bunting feeding on reeds near the barn whilst a robin competed for our attention from a nearby hedge. Beyond the barn there was much activity from small birds in a ploughed field. They were extremely active, but very hard to see once they landed on the ground. After spending some time watching them, we could tell there was more than one species; we worked out skylark, but the others seemed smaller. The only other species we managed to identify was stonechat. A common buzzard was being mobbed by a crow and flew away from us. Some of the group found a few redwing feeding on hawthorn berries off the main track, along with wood pigeon, feral pigeon and collared dove. A kestrel hovered over rough ground looking for food, and another was seen on the telegraph wire along the long trek to the beach. In the fields there were groups of meadow pipit and skylark flying around, occasionally going to ground and instantly disappearing into the landscape. We moved towards Shellness and it was good to stride out and warm ourselves up, with occasional stops to scan the fields. Several marsh harriers (females or juveniles) were seen in the distance – identified by their pale heads – but then another individual appeared, it had a white patch on the base of the tail – a hen harrier! The white patch indicates a female or juvenile bird and is often referred to as a ‘ringtail’. 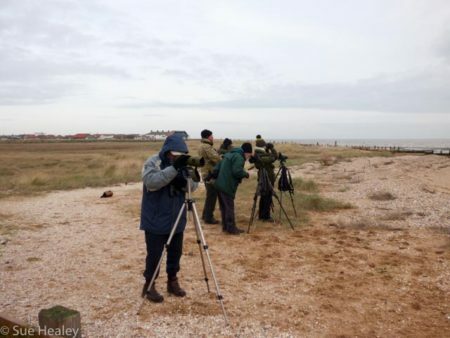 What a brilliant way to celebrate the start of our new year’s birding. Although the tide was still quite a way out as we neared Shellness hamlet, there was lots to see. More brent geese and oystercatcher along with grey plover, redshank, sanderling, dunlin, mallard, gadwall, wigeon and four pintail. Interestingly, there were only a few black-tailed godwit when we would usually expect to see large groups of them in this area. Even later, when we viewed the high tide roost there was a distinct lack of them. Do they move to another area at this time of year? 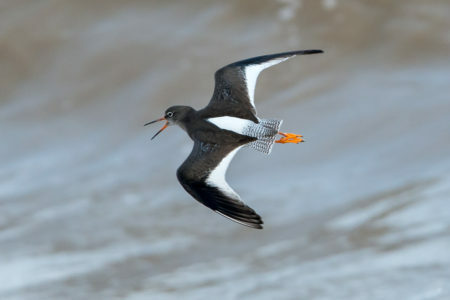 Do they come into the high tide roost later than the oystercatchers, dunlin and sanderling? An interesting conundrum. 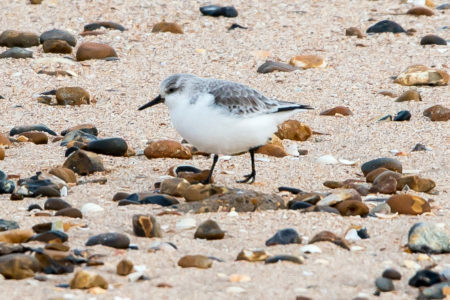 Scanning the beach between the hamlet and the blockhouse, there were good opportunities to see more sanderling and compare them to dunlin. Four knot were also present, another wader identification lesson for us all. Grey plover, redshank and ringed plover were seen and a few shelduck were feeding along the waters edge. A great-crested grebe flew down the Swale giving a good view and another learning point of the bird in flight. Soon it was time to walk back to the cars and lunch but on the way there were at least 30 linnet feeding on small seedheads along the high tide line, allowing us much better views than those in the fields earlier. After a warming lunch in the vehicles, we moved on to Capel Viewpoint. As we turned off the main road we met a shooting party, with beaters gathering with their red flags ready to drive the birds to the guns. Seeing red-legged partridge and pheasant after that was rather sobering, knowing they would probably be shot before we left this afternoon. The one small positive I could take from it was that land managed for the game birds to be released in, provides habitats for other species, such as skylark and meadow pipit and also habitat for small rodents – a great food source for kestrels and owls. Timing is key, as you need to be there in time for dusk, but not too early, or the wind (which is always whipping from one direction or another) will freeze you and send you scurrying for the protection of the car. We did quite well this time, but it was still a cold watch. Some members of the group managed to spot barn owl, and a male hen harrier, whilst most of us saw another ‘ringtail’ hen harrier, along with several marsh harriers, over 30 mute swan, mallard, pheasant, black-headed gull, herring gull, coot, and a particular specialist of this area, corn bunting, in their usual bramble bushes, occasionally giving their ‘jangling key’ song. A distant bird was identified as a peregrine by another bird watcher present. All in all a great day. Thanks to everyone for their good humour in such cold weather, to Malcolm and Sally for co-leading and to Steve for the brilliant photographs. Apologies if I have missed any species – you can always add them in the comments. A great start for 2018 and brilliant photos Steve, esp. the redshank. A lovely, if rather fresh day and another good turn out. So many species seen and the highlight has to be the ringtail. A good report Sue and thanks for leading with Malcolm and Sally.